St Andrew’s Healthcare is a charity providing specialist mental healthcare for patients with some of the most complex, challenging mental health needs in the UK. The majority of their 900 patients are referred to them via the National Health Service. They develop innovative ways to help patients recover, creating a package of care designed around each individual, their preferences and needs, and focus on physical and spiritual wellbeing as well as mental health. WDAD Communications was appointed to support St Andrew’s Healthcare in the delivery of their transactional recruitment advertising and to help devise and implement an employer brand strategy. Our objective was to ensure that they were using robust employer branding messaging that accurately reflected the organisation’s vision and values, raised the profile as an employer of choice, complemented the work being done separately to revise the corporate brand, and as a consequence, to increase the effectiveness of application and hire rates across all positions in general, but with a particular emphasis on experienced (Band 5) Nurses. 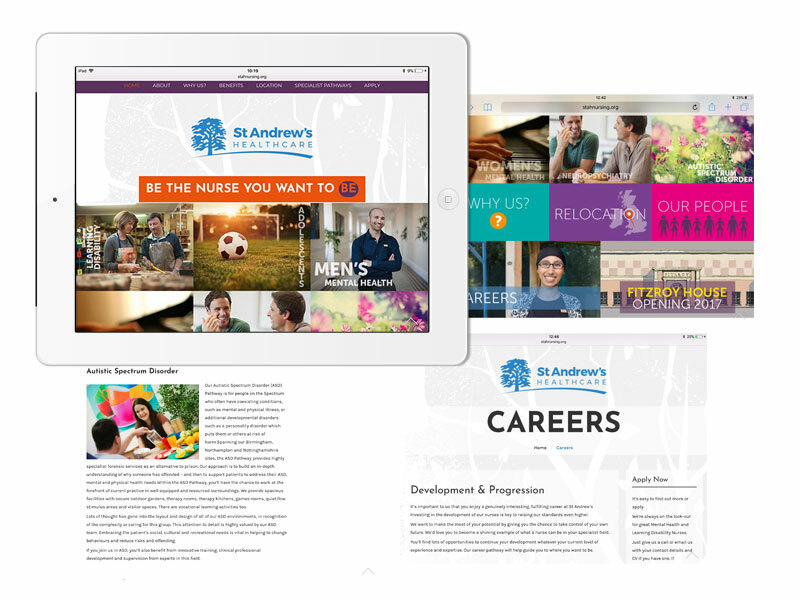 The St Andrew’s Healthcare recruitment web pages were absolutely central to both the recruitment process and the effective delivery of the employer brand and our overall objective. So, rather than just being another section of the corporate site, we devised a dedicated careers microsite just for nursing roles where all the relevant information was available and easy to find and navigate around when candidates arrived on the site. Also, by giving nursing vacancies their own ‘space’, consciously, or sub-consciously we were also saying to perspective candidates that these positions were important to St Andrew’s and needed to stand out from the other opportunities that they had to offer. It was a simple, yet beautifully crafted responsive microsite, that had an impactful home page design using strong visual images to introduce their mental health service specialisms: Learning Disabilities, Men’s Health, Women’s Health, Adolescence, Neuropsychiatry, and Autistic Spectrum Disorder. It had a link to the live jobs posted via SAP (all of which we had rewritten to better reflect the new brand) and crucially, it also featured roll-over devices that provided clear and concise information on the location of the roles and available relocation assistance, case studies of current employees, as well as all the other benefits and rewards on offer. And it was one of these benefits in particular that was the focus of our over-riding EVP; Be the nurse you want to be. This proposition was borne out of an extensive research programme, and emphasised that St Andrew’s Healthcare was a place where their size and breadth of expertise meant you could explore different specialisms in the early stages of your career. Then, you could follow the structured pathway that’s right for you as your experience grows – with generous support for your professional development and could become the mental health nurse that you always wanted to become. In other words, you would be an integral part of a community of experts in a team dedicated to delivering holistic, innovative world-class care at our unique facilities. You’ll know that you’re working for people not profit – at a leading charity that reinvests surpluses instead of enriching shareholders. And, you can go further to achieve amazing results and outcomes for service users – to transform lives and help them be the people they want to be.